The stamp is from Kiwi Stamping, and I gold embossed it, cut it with a SB Labels Three, before adding some colour with chalks. I used washi tape with destinations printed on it to ground the car. My printer is currently not co-operating with my computer, so the words were written free hand, trimmed and edged with the same pen before sponging. All the edges were sponged using Tea Dye and Walnut Stain DI. I trialed the home made sponge daubers that Suchi shared here, and loved them - I can see a lot more being made. I made this card some time ago and missed blogging it. The star of the show is the flower stamp, which is one from a magazine. I stamped and embossed, then masked the two pink flowers and sprayed the card with the purple spray. I then stamped, gold embossed and trimmed the centre image, and mounted it on foam, tucking some rose buds behind two of the intersections. The final detail was some white ric rac that had some wee red tufts on it placed diagonally across the corners, the lower one being layered over some purple organza ribbon. Thanks to the lovely Shaz in Oz, I have become aware if some changes that Blogger is going to be bringing shortly - it may mean a drop in the numbers of followers for those of us blogging with Blogger, and that some of my followers may not be able to be notified of, or read new posts after 11th January, or comment. This is their post which explains things, not that I am impressed, but they call it progress! I hope this does not inconvenience any of my readers, as I so appreciate you all. I do hope you have all enjoyed your Christmas, no matter how you celebrated. We had a wonderful day filled with family. Yes, I have been making the most of the True North set of stamps - again. I started with a piece of corrugated card, covered it with gesso, then smoothed some gelatos over the top of the ridges before spraying it with water mixed with some Lindy's Magicals (pigment powders) in Whale Watch Blue. The ship was stamped on the snippet of white card. After painting it with Twinkling H2O's, I die cut and sponged it with Distress inks. I stamped and silver embossed the lighthouse and sentiment on blue card, and sponged the edges with Memento Platinum ink. I assembled all the elements onto a white base of which the edges had been sponged with blue ink. I finished the inside by randomly stamping the compass from the set in blue, and adding a birthday sentiment - unfortunately I did not photograph it. I would like to extend Christmas greeting to my newest follower - Gerrina from the Netherlands. I had fun making this somewhat whimsical card. I started by pulling out the bike die from my NBUS stash, and cutting it in silver. I then decided that I wanted to put something in the basket, and found that this mouse image, (an old Penny Black stamp) when trimmed, would fit perfectly. I silver embossed the image and coloured with water colour pencils, and added Glossy Accents to the balloon. The banners were hand cut from snippets in my 'promise box', and the sentiment panel was die cut with a stitched rectangle, from an experimental piece in there too, then embossed with silver. Here is a close up of the bike. Note to self - put glue on finely cut images with a toothpick, and not the glue bottle nozzle. I grounded the bike by mounting it on a strip of washi tape. Rhinestones were used to finished, and turned an otherwise nondescript card into something I am happy with. The sub- title of this post should read - with two fails and one save!! 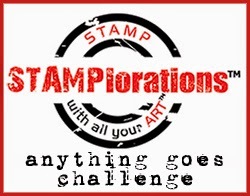 Once again I have been playing working with the STAMPlorations True North set of stamps. I started by cutting a rectangle using a Memory Box Stitched Rectangle from watercolour paper, then stamped and clear embossed the ship image. I had stamped the sentiment on this panel before I sprayed it, and being in distress ink, it reacted to the moisture and slightly smudged... argh!! The birthday greeting was stamped on a snippet and cut with a small stitched rectangle, some fairly coarse twine was knotted around it, and both panels were mounted over an orange base - the recipients favourite colour. He is also a person who hates clutter, so a plain card is what he appreciates!! All comments are moderated and spam removed. Before I printed him out, I added an age circle, a freebie from Cindy Close in 2011. I have tried to 'find' her since to insert a link, to no avail. I masked the images and sprayed the background with a colour wash and a wee bit of Lemon Shimmer Spray before painting the super hero with acrylic paint, and colouring his face with chalks. I coloured the outside edge of the circle with red pen, before adding clear stickles. The number was covered with gold stickles, which blobbed in the process, so after a quick scrape and dab, I was left with a smeared background, much to my frustration. I touched up the digit with a gold pen (which does not show as much IRL, as this image is approx 2x the size). I layered the mounting of the image, sponging the edges of each layer as I went, and stamped and embossed the sentiment in gold on the top of the middle layer. The fix for the smear - yes, the stars!! As a friend of mine says, "there are no mistakes, just opportunities for creativity". This card has been made with a small girl turning five in mind. The image is a digi one that I received in a RAK some time ago from the lovely Shelly of My Creative Rumblings. I painted her with Twinkling H2O's, and used Stickles for the wings and Glossy Accents for her eyes. I trimmed the image panel, rounded the corners and sponged the edges with Delicata Gold ink. Before I mounted it with foam dots, I sprayed the die cut stitched rectangle striped panel with some Citrus and Silver Glimmer Mist. I recently purchased the STAMPlorations set True North and decided to ink it up the other day as I was needing a masculine birthday card. I started by stamping and silver embossing both the image and sentiment. I then added masks before adding colour - the sea and the sea fog I used dusters to apply the colours, which gave a sense of movement, but not violent movement. The 'beams' were dusted on too, but I used sponges on the sky, which gives a hint at turbulence that may have just calmed.. I added dots of stickles for stars. After tying the bakers twine around the panel, I added a thin strand of gold thread for interest. I then mounted this panel over a lighter blue base. and added a birthday greeting too. This is the second card I taught at this months class, and to mix it up a bit I gave the class options in the way of image and background stamps, and we had some great cards made. I used an old Rubbadubbadoo stamp and coloured it with Water Colour Crayons (omitting the leaves),and then spritzed it with water and stamped it. As it did not turn out quite how I wanted it, I took a wet brush and moved and added colour to the image, and grounded it with a wee bit of 'shadow'. I then masked the image, inked the (old) Hero Arts gauze stamp with distress ink, spritzed it lightly and stamped over the image. The final detail was to emboss the sentiment (a Montarga stamp) sponged the edge of the (hand cut) banner, and attached it, snagging some multi-coloured metallic thread under it. This second card was made using the same methods and stamps, just a different coloured background. This is a snap of the group concentrating on the negative colouring from this card. We had a wonderful afternoon with lots of laughs. It's good to be back - (real) life got busy last week, but it is good to be back here now. I used another piece of this gorgeous pearlised floral paper, I love the sheen on it, and at the right angle the sheen turns gold, as in the top right hand corner in this photo. The trellis was cut from gold card, and then trimmed it in half before attaching it. Tea Dye DI with a few clear rhinestones to glam it up. The butterflies were cut from scraps/snippets of white card and sponged and given several coats of WoS, then layered over a solid die cut from pink metallic paper. Drama Queen was inspired by it. When I first envisioned this card, I did not correctly remember the angel stamp, (an old one by Anita) and it is smaller than I first thought, but still it is the 'right' one for this card. I simply gold embossed it on the black - I did try adding WoS to the wings, but it didn't really show up, and in fact dulled the embossing. The sentiment is from a Layers of Color (discontinued) stamp set. The accents are lace and thread (gifts from a friend) and the piercing on the edges of the black layer. The piercing was done with a spoked wheel that was my mothers, and she used it in dressmaking!! All comments are moderated and spam will be deleted.